We always recommend that you backup your computer on a regular basis but we know that things can happen. For when those things happen, Mad Dog Computer can help you get your information back with our Data Recovery service. If you think that your information might have been lost, the first thing to do is TURN OFF YOUR COMPUTER! While you are using your computer, the normal operation of your computer will continuously overwrite portions of your hard drive, flash drive or other media which it thinks are unused. Sometimes, due to a software or hardware malfunction or some sort of MalWare (Malicious Sofware – Viruses, etc), areas which are actually used storing your important information can get marked as ‘unused’ and your computer will start to use these areas to store files. Just having your computer turned on will cause areas of your hard drive to be overwritten. The longer your computer it turned on, the more of your files will get overwritten. If your data is missing due to a hard drive malfunction, we can frequently get the data back for you fairly inexpensively. 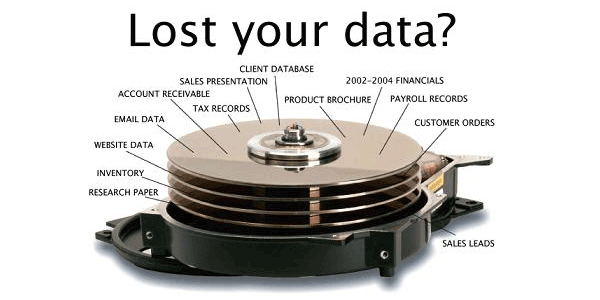 If your hard drive is severely damaged, data recovery is only possible with the use of a clean room facility. The facilities are extremely expensive but are available if you just can’t afford to lose your information.